Written on November 15, 2016 . Posted in Announcements + Updates, Graduate Studies. 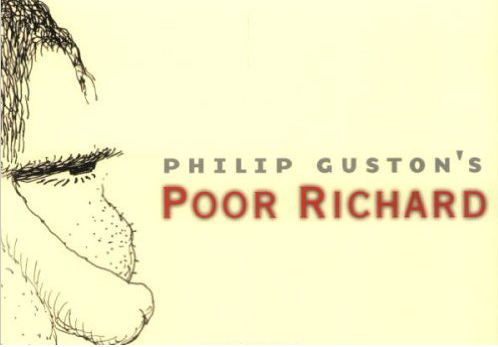 Debra Bricker (Graduate Studies) will discuss her book ‘Philip Guston’s Poor Richard’ as part of the Huaser & Wirth (548 W. 22nd Street, New York) exhibition entitled Philip Guston: Laughter in the Dark, Drawings from 1971 & 1975 on 17th November 2016 at 6:00PM. ‘Philip Guston: Laughter in the Dark, Drawings from 1971 & 1975’, is an exhibition devoted to the late artist’s satirical caricatures of the 37th President of the United States: Richard Nixon. Featuring some 180 works depicting Nixon and his cronies, the exhibition includes Guston’s infamous Poor Richard series and brings together over 100 additional drawings and one painting never before seen by the public at large. The exhibition marks the first time this entire body of work has been presented together to the public.